← The Ice Fishermen Triumph! Rhode Island Softball in One Day! 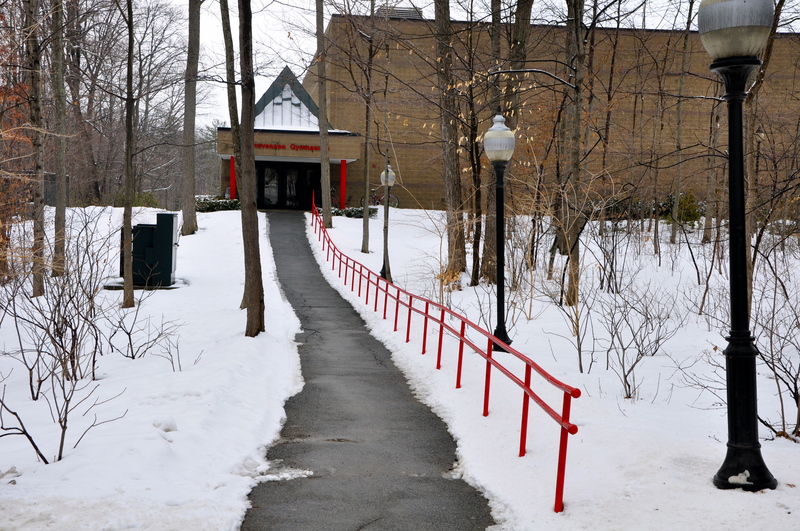 The college did plow the sidewalk, the blacktopped sidewalk. This past weekend my daughter Tory attended a softball clinic at Bryant University in Rhode Island on Saturday then we got up at 5:30 a.m. and on the road headed north by 6:15 a.m. so she could join her club volleyball team at a tournament held at Bard College in Dutchess County, N.Y. Have you ever visited Dutchess County? We never had so we were surprised at the lack of civilization bucolic scenery, snow, biting cold, and dirt roads. Seriously, the college has a few paved roads, but the majority we traveled are dirt. Oh yeah. These are some serious "series" potholes at Bard College. The first type is “Monster.” A Monster pothole is singular and very, very large in size. It’s typically situated so that a driver cannot avoid putting one set of tires or the other directly into its yawning maw. 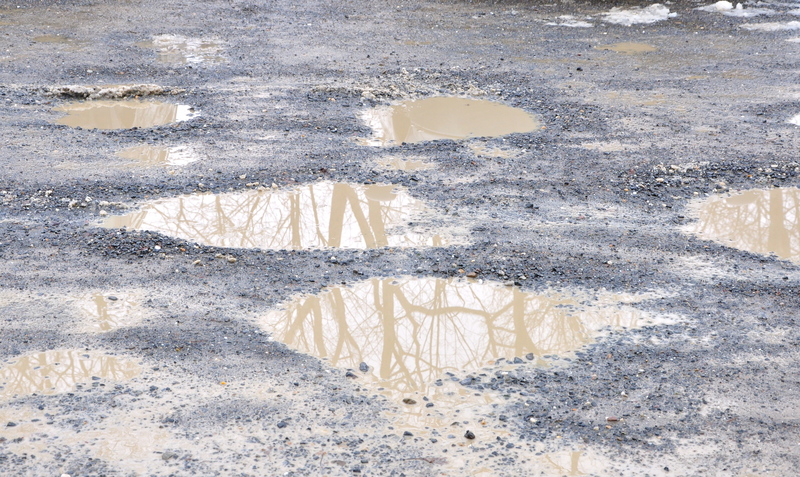 That’s the kind of pothole I hit while driving down Main Street in Little Falls, N.J. When you hit a monster pothole in an Audi A5 with low-profile tires, you get an immediate flat tire. 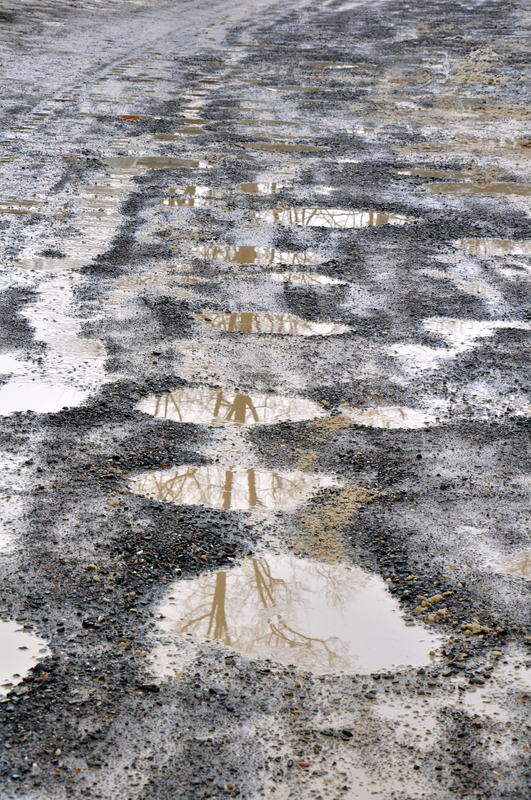 The second type of pothole is “Series.” A Series is a cluster of potholes, typically spaced in a relatively straight line, and positioned so that a driver has a choice of hitting every pothole in the series or swerving into traffic for a guaranteed collision. Choices, choices! Bard College wins, hands down, for presenting the “Best” in a Series, in my educated opinion. Take a look. How 'bout them potholes at Bard College?! By some miracle (I think it was all of you praying for traveling mercies for Tory and me. Truly!) I navigated my way around and through (a nail biter, to be sure) the Series and off campus. We hopped back onto the N.Y. Throughway and headed South. And may I extend my thanks to the New Yorkers who travel at high speeds, safely? We slipped in behind your cars and shaved 20 minutes off the trip home! P.S. My son Max’s 2000 Subaru Forester blew a head gasket on Saturday. The mechanic is looking the car. Verdict? Stay Tuned.